Stay connected when you’re on the go. When your work takes you everywhere, it can be hard to keep on top of your diary. But with TSheets Scheduling, evenings and weekends can be yours again. Cut the time it takes to schedule jobs down to a few seconds. Just choose the day, time, and client, assign your employee(s), and that’s it! 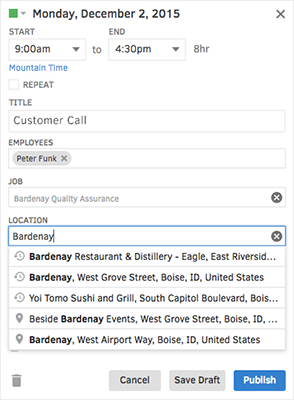 Find unassigned jobs at a glance. For longer-term projects, repeat last week’s job schedule with a single click, including any customised colour-coding you’ve added. Turn leads into revenue and cut costs. Stay ahead of the competition. The moment you assign a job, whoever’s scheduled to work on it gets an email and mobile alert straight to their phone—whether that’s you, an employee, or a whole team. 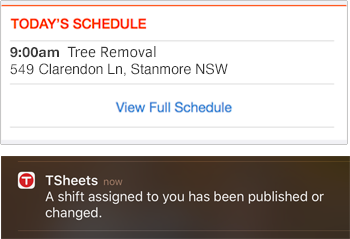 When an urgent job comes in, you can send the time, location, client’s details and your notes to whoever needs them via the TSheets app. Not sure who to assign? Create the job and assign it later. Use GPS tracking for a lightning-fast response in emergencies. When a client needs you right now, your TSheets time clock has the answer. 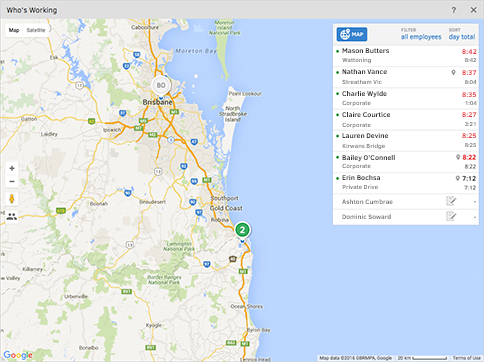 Use the Who’s Working window to find out who’s available and where they are so you can get your nearest tradie out to them straight away. See at a glance where your entire team is—on a single map—to be the first to respond in an emergency. Just assign the job and everything the employee needs will appear on their phone. Keep everyone in sync with a single system. Because it’s TSheets, you get time tracking and scheduling in a single powerful solution. Once a new roster is published or changed, or a new job is booked, every employee assigned to it gets a friendly reminder to clock in for their job and track their time—so you know how long each job takes. To clock in and out they simply tap their screen. No smartphone? No problem. Use the Crew App instead.